A recently released report of results from the Ohio Graduation Tests (OGT) places Notre Dame-Cathedral Latin School in the top 6% of all 1,006 high schools in Ohio, an achievement that earns NDCL a spot on the Gerber Analytics “Top Academic Ohio Schools” list for the seventh consecutive year. The Gerber Report also shows that NDCL is the top-ranked school of the 19 public and Catholic high schools in Lake and Geauga counties. The report includes performance data for our current juniors, who took the OGT as sophomores last March. Results from the OGT, the only state-mandated series of exams for high school students, are among the performance indicators the Ohio Department of Education includes in its annual report cards for public schools. “For example, the state issues a Performance Index score for each school as composite measure of student achievement on the OGT. The Gerber Report reveals that NDCL and Saint Ignatius share the same Performance Index: 111.2,” Mr. Waler noted. 95.8% of NDCL sophomores passed all five OGT exams on the first try, placing NDCL 31st out of 1,006 schools. Reading: NDCL ranked 30th, up from 40th last year. Writing: NDCL ranked 38th, down from 21st last year. 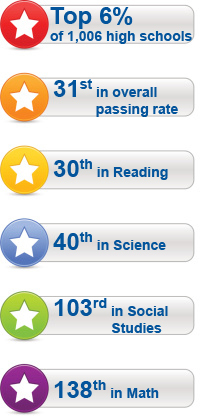 Science: NDCL ranked 40th, up from 52nd last year. Social Studies: NDCL ranked 103rd, up from 122nd last year. Mathematics: NDCL ranked 138th, up from 152nd last year. “When you bore down into the data, you see that more NDCL students scored at the advanced levels in Science and Social Studies than at any time in the past five years,” he continued. To view a detailed analysis of NDCL's results, visit the Gerber Analytics website. The Gerber site also enables you to review the OGT performance of any high school in the state of Ohio as well as to compare any two schools side-by-side. NDCL's impressive OGT results follow our students’ strong performance on the ACT. As noted in a previous issue of On-Lion, NDCL’s Class of 2013 posted the school’s highest ACT scores in all subject areas since at least 2001, the earliest year for which records are kept.